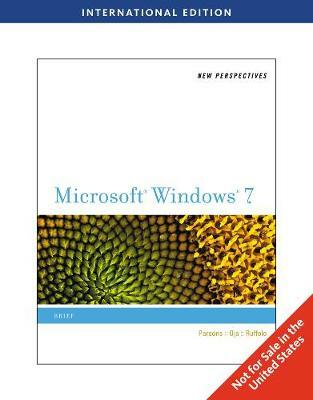 NEW PERSPECTIVES ON MICROSOFT WINDOWS 7, International Edition takes a critical-thinking approach to teaching Windows 7 concepts and skills. In addition to in-depth coverage of essential topics, this book also covers some of the coolest new features to the Windows Operating System including Live TV and Windows Touch. The New Perspectives Series has also added new pedagogical elements to help students with all learning styles absorb key information. The Visual Overview at the beginning of each tutorial gives students a visual look at the content, as well as a study guide for later use. ProSkill Boxes and Exercises provide students with information and practice on Professional Skills that relate to that tutorial's content.